Imprinted multi color reindeer antler headbands are perfect for any holiday event or Christmas celebration. 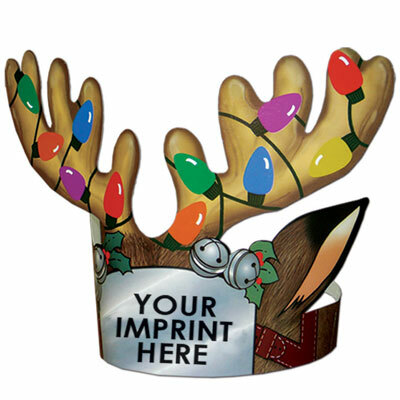 Great for kids and kids at heart, will love wearing these pre-printed stock graphic antlers with a one color imprint for your custom logo included. Reindeer antler headbands are adjustable to fit most children. Made from high density, white paper board, liquid laminated front for a high gloss finish. Reindeer antler headbands are shipped flat. Above prices include one color of imprint.